Heading back into the barnyard..
We woke up to snow yesterday morning and that is what it did all day! Last report I heard, our area received 19 inches! The weatherman got it right this time. In the morning I opened the gate to the barnyard and called the ewes, 30 seconds later they were filing in. But the snow was coming down pretty hard, and this is part of the winter routine. They are smart girls, they know there is mostly likely some nice Alfalfa waiting for them on the other side of that gate. Hours later, they were still out, picking through the hay instead of taking cover behind the barn. Lucy, one of my favorite Border Leicester ewes. Trying to pretend I do NOT see all of that hay in her beautiful fleece...sigh.. 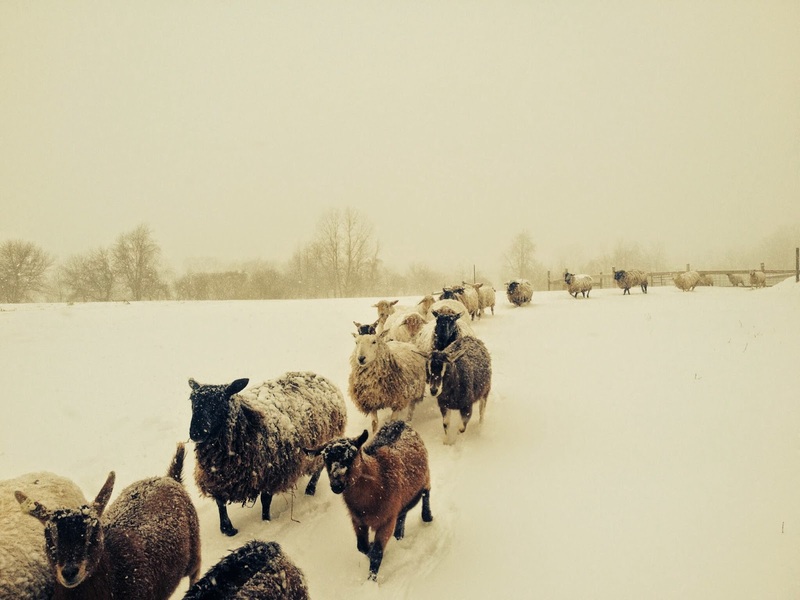 Perfect indicator-that it is not that cold, goats out in the snowstorm instead of hiding behind the barn. Hopefully no more snow today. He was especially thankful for that wool hat, made from Ethel's fleece. When he came in it was covered in ice and snow, but his head was warm and dry. The inside of the hat was still dry. 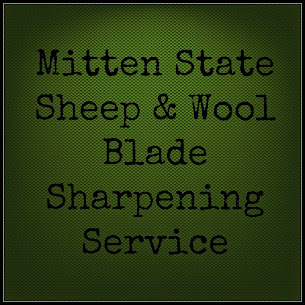 That is wool for ya! ****I just want to add, that we love our sheep! We always seem to get some concern that they are outside, in this type of weather. I can assure you they are fine. They had windbreak, cover if they wanted it, hay, and WOOL. 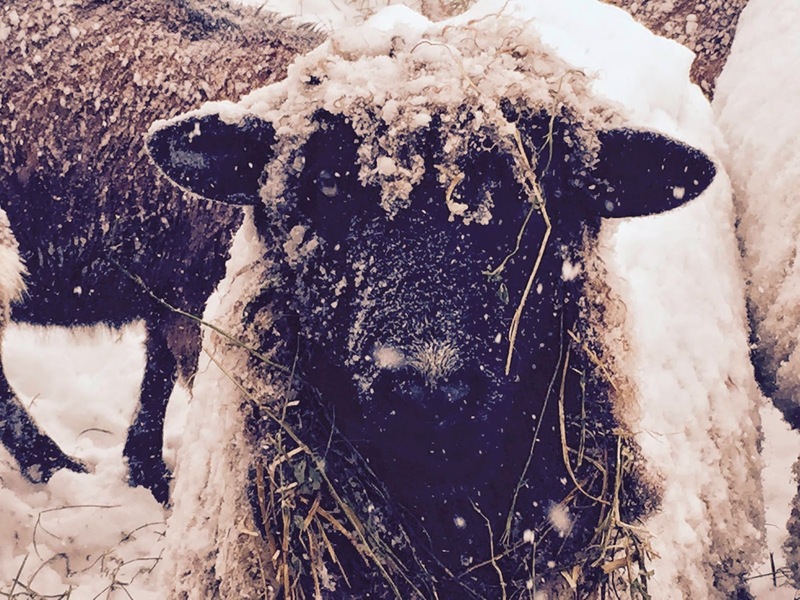 We have never lost a ewe in a snowstorm, or even had one get sick. They have everything they need to take good care of themselves and they do just that. If I thought for one minute, that they would perish, I would force them into the barn whether they wanted to go in or not. 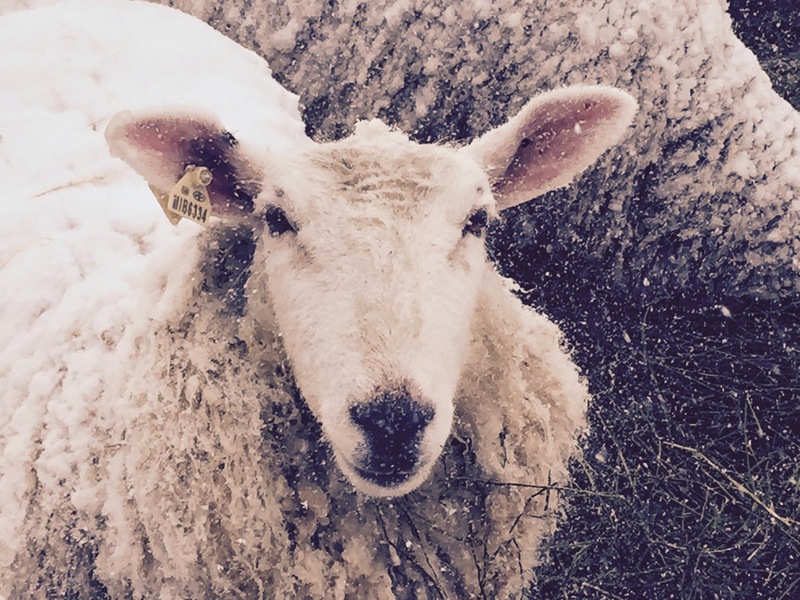 But raising sheep for over 17 years has taught me not to panic at the first sign of snow, or if the temps drop below 30. They look plenty cozy:) I can wear a wool sweater in freezing temps and be warm, and I am a cold temp. wimp. They have more than a sweater's worth. And yes that hay in the fleece ~ what fun come spring. Maybe she's just wanting to add a little extra fiber to the mix. 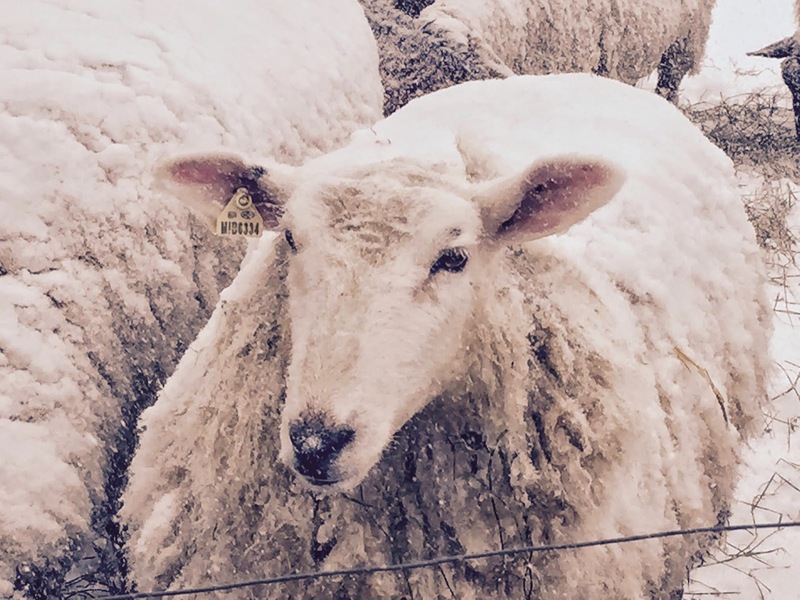 I wish I was as efficient at staying warm in the cold as sheep were. You got such neat pictures! Yes, that is what I call myself:) thank you! 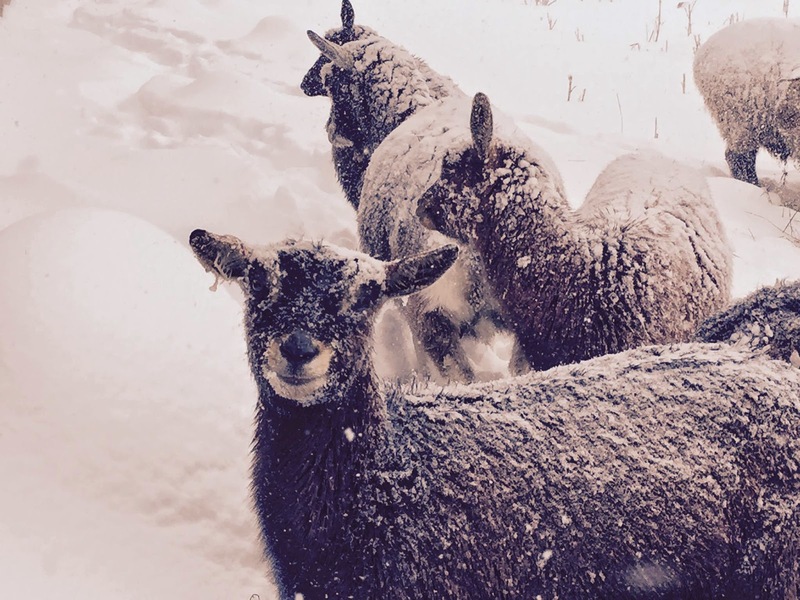 If the sun is out, and it's snowing, our goats prefer to be outside too. 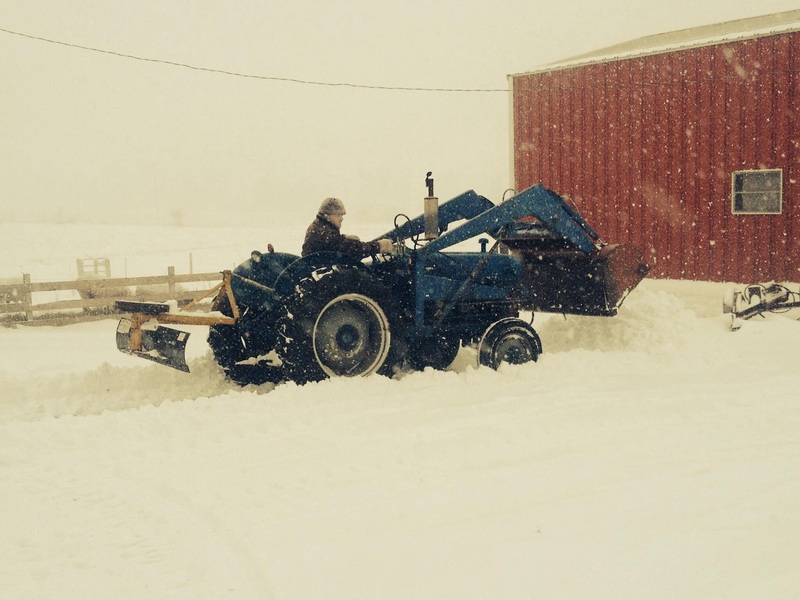 You got a bit more snow than us, but I think we are due to get more this week. Cute photos. Your pictures are beautiful. How do you get your sheep to pose so nicely? Mine come right up to the camera and I get great shots of their nostrils. I love your photos. And your sheep look just fine (and happy!) I marvel sometimes at the weather our ducks love to hang out in, but like you, if I thought for a second, I would force them inside. Thanks for sharing at the (mis)Adventures Mondays Blog Hop. I can't wait to see what you share this week! P.S. You are our feature this week! Congrats! !